Bloodsucking Bastards stars Fran Kranz as Evan, a dutiful and overworked employee stuck at a soul-killing corporation with his beautiful co-worker and girlfriend Amanda (Emma Fitzpatrick) and his slacker best friend Tim (Joey Kern). Evans world begins to crumble when Amanda dumps him and his boss Ted (Joel Murray) hands his coveted promotion to his nemesis Max (Pedro Pascal). When his office mates start going through disturbing changes, Evan must find a way to stop the evil brewing amidst the cubicles, and rescue his workplace pals before his life and career go from dead-end... to just dead. First and foremost, the practical FX are done exceptionally well here. Once the movie gets going, it's just pure gore galore and I think any horror fan can appreciate that. The amount of blood in this movie rivals that of Evil Dead 2 and Nightmare on Elm Street's blood geyser scenes. Solid performance from a cast of who's-who of horror and comedy movies. Franz Kranz (Cabin In The Woods) takes on the goofy hero role once again and delivers like only he can. As does the awesome living legend Joel Murray (Hatchet,One Crazy Summer). Joey Kern (Cabin Fever) calls up a mixture of his characters from Grind and Cabin Fever and delivers a perfect slacker performance that he has fine tuned. The beautiful Emma Fitzpatrick (The Collection) shows off her talent and badassness with another solid performance. Also there is a quick cameo by Matthew Lillard (Scream, Scooby Doo). This really is a cast chock-full of comedy and horror icons. The story is a perfect blend of horror and comedy. 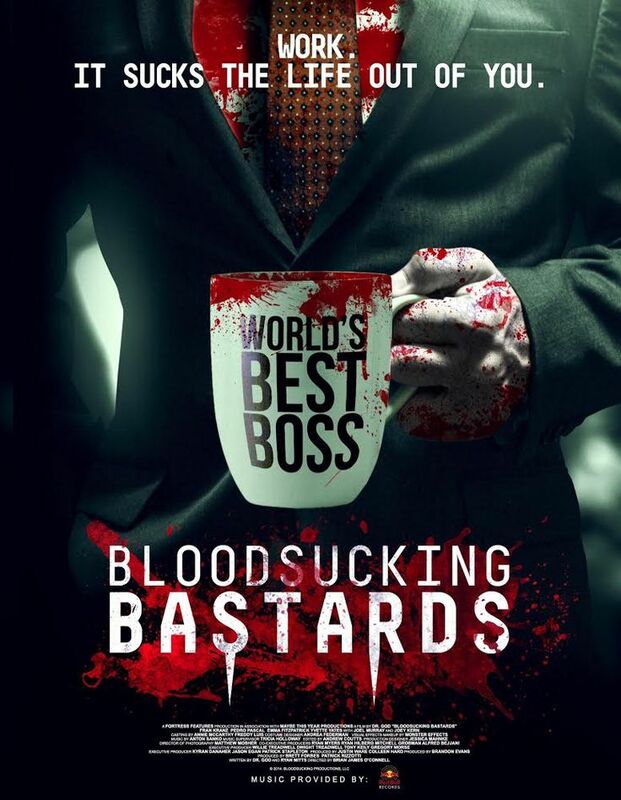 Think Tucker and Dale vs Evil, but with a ton more blood and stupid-funny office humor. If you are looking for a ton of laughs mixed with the right amount of blood and gore, then look no further, Blood Sucking Bastards has what you need.